Design a functional, stylish work space with Open Studio Taboret. 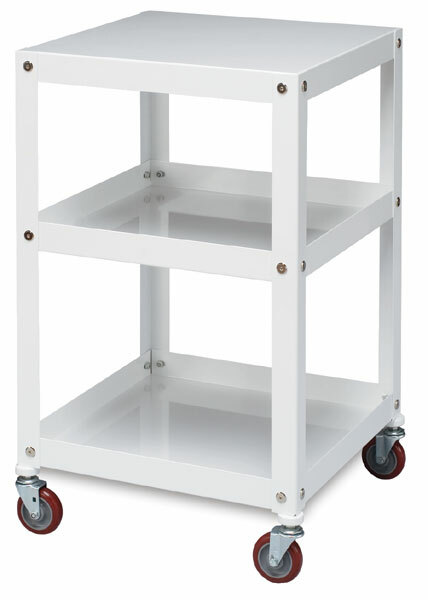 Made of sturdy, powder-coated 16-gauge steel, the taboret rolls effortlessly on red, non-marring, lockable caster wheels, so your materials are always right where you need them. The glossy white taboret also offers the versatility of reversible shelves that can be easily installed upside-down as trays — perfect for storing brushes, pencils, paints, books, and other supplies. The Open Studio Taboret measures 30"H × 18"W × 18"D and makes a great platform for projectors. Assembly is required. Tools are included. ® Open Studio is a registered trademark.